Welcome to the Gordon Brown & Sons website. 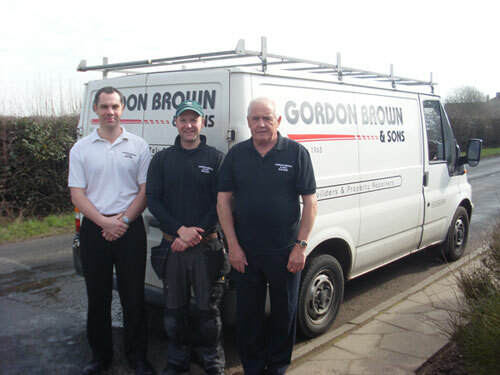 Gordon Brown & Sons are a family run business established in 1963 based in Hartford, Northwich. We have worked all over the Cheshire area for over 50 years. Our areas of work include domestic extensions and alterations, all types of joinery works, all types of building works and commercial works including schools, police stations and public buildings. We have worked for Cheshire County Council for over 35 years and we are on the CCC list of approved contractors. We have 14 employees on a permanent full time basis whom are all time served tradesmen and have been with us from 3 years up to 30 years. We pride ourselves on excellent quality workmanship and we are very well established and known around the local area. We are extremely reliable and can carry out all types of jobs from very small property repairs to large extensions, all to suit the client’s requirements. We offer a comprehensive site survey and detailed quotation service totally free of charge. We can visit your property during the daytime, evenings or at weekends all to your convenience.